Any discussion of Spanish Gypsies would be remiss without a consideration of Flamenco, which lies at the very soul of these often misunderstood and misrepresented people. In the past few years, there has been an ever increasing interest is all things "gypsy" and what is termed "Spanish-Arabic" in the Middle Eastern Dance community. I am very happy to see this interest and believe that creative fusion of art forms can lead the way to artistic evolution. Although there are many theories promising to explain the meaning of the word flamenco, most lack enough evidence to substantiate them. One commonly accepted version translates flamenco as Spanish for the Flemish soldiers of the Spanish-Belgian Territories. These soldiers were renowned for their self-confidence, style and ostentatious pride, all qualities that reflect the gypsy character. In fact, the term "flamenco" came to be synonymous with "gitano" (gypsy) in Spanish Romany Argot. Between 800 and 900 A.D., a large exodus of people occurred from the Punjabi region of India. These people are believed to be members of the Untouchables, a group within the Indian caste system comprised of animal traders and trainers, acrobats, dancers, musicians, palmists and metalworkers. These nomadic groups, generally referred to as Roman and/or gypsies, divided into two major migratory routes, the most traceable moving west across Asia and the European continent, including Spain. The first recorded account of Spanish Gitanos "Beticos" dates from 1447 in Barcelona. It is also believed that a second migratory route took them down to and across North Africa (including Egypt) and up into Southern Spain "Andalusia" via the Straights of Gibraltar. This faction, known as Cale (black), has been far more difficult to verify and trace due to the great similarity of appearance and lifestyle to the indigenous peoples along the route. We should not forget that Southern Spain was part of the Islamic Empire for a period of 800 years. Although, the Northern Beticos immigrated to the more tolerant Islamic region of Andalusia, to this day, the gypsies themselves maintain a great distinction between the Beticos and Cales, with virtually no intermarriage between the groups. During the Inquisition of the Reconquista, even this tolerance ended while gypsies from all over Spain were herded into "gitanerias" or ghettos. However unjust and cruel, this persecution and isolation was the very influence that safeguarded the purity of their music and dance within the family group. Finally, in 1782, the Leniency Edict of Charles III restored some measure of freedom to the Spanish gypsy and allowed this music and dance to be presented to and adopted by the general population of Spain. This resulted in a period of great exploration and evolution within the art form, which continues to this day. Western African influences via the slaves of the New World Caribbean, Central and South American colonies. These include Rumba, Garotin, Guajiras, Columbianas, etc. Although much less research has been undertaken in the field of flamenco dance than music, it has been documented that during the Phoenician empire, in the city of Cadiz, Hindu dancers were hired as entertainers for the festivals, aspects of which were incorporated into local processions and religious festivals. This very strong resemblance to East Indian dance is seen in the Katak, NianiPuri, Kathakal and Bharatanatyam forms. Elements such as the deep-seated plie, outturned leg position, sharp angles of the body and arms, splayed fingers, rapid barrel turns and, most certainly, the percussive foot movements are all evident in flamenco dance. As previously mentioned, the Mozarabic "Zambra" was occasionally performed for a very brief time during the late 19th to early 20th centuries, although its role in the development of flamenco dance is minimal. This dance, in 2/4 time, combined elements of Andalusian folk dance with Arabic elements, such as finger cymbals, tambourines and atypical theatrical costuming. However, this bears no resemblance to the performances of Sevillanas, Tangos and Bulerias by the commercial, touristic band of gypsies in the caves of Granada, which Amaya identifies as Zambra in her video "Gypsy Fire". In fact, apart from some of the percussive foot movements found in the Moroccan Shikhate, there is almost no similarity between flamenco and Middle Eastern dance. 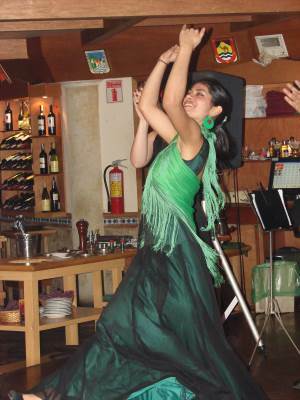 Even the open-knee hip movements of flamenco are attributed to the African influence from the colonies and/or Indian dance. Absent to flamenco dance are the torso undulations, pelvic oscillations, hip shimmies and rotations, all of which are fundamental components of Oriental. Finally, the soft, fluid, feminine, sweet and joyful external nature of Middle Eastern dance is the complete antithesis of the internal, spring-loaded, strong, defiant, explosive, masculine character of Flamenco.